Ever wonder what a dad looks like right before a c-section? 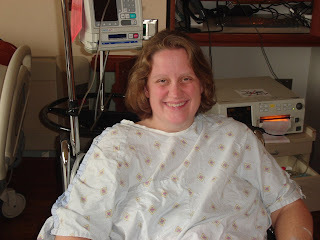 How about an expectant mom awaiting her c-section when the OR is behind schedule? Duncan came to the hospital with my mom and the girls, mid-morning. Since I wasn't scheduled for surgery until noon, I had a fair amount of time to kill in the morning. Things went quickly, but seemed to take forever, all at the same time. I was finally brought into the OR at around 1:00. The first order of business was starting the spinal block. 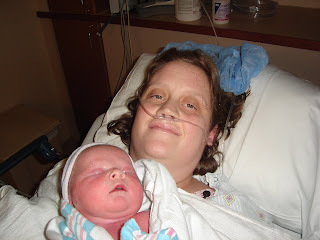 I had had an epidural with Amelie and a spinal with Violet. I wasn't in the least bit nervous about this part of the process. However, it turned out to be a very big deal. The anesthesiologist made countless (6 or 8?) attempts at getting one started and, for whatever reason, she couldn't. I remember the assisting doctor telling her that "it was her call." She made one last attempt which failed and then "called it." That meant that she was going to forget about starting a spinal and use general anesthesia. This meant that I would be asleep when my baby was born, cried for the first time, was cleaned up and weighed. This meant Duncan had to stand outside of the OR while his son was born. I was told that the baby HAD to be out within 10 minutes of me being under, which scared me. I remember looking at Duncan, upside down, as he gently cupped my face, smiled, told me I'd be OK, and kissed me goodbye. I remember smelling the anesthesia gas. I remember someone telling me I might feel some pressure on my neck. I never did. Instead, I fell into a dreamless sleep. I woke up in the recovery room. Duncan was sweetly saying my name, trying to get me to open my eyes so I could see my son. He was in a warmer or a bassinet to the left of my gurney. I couldn't really see him, but I could hear him. Every time he exhaled, he made an audible sound. Duncan explained to me what was going on very calmly. He was "grunting," which is not atypical in c-section babies. Since he was just about an hour old and he hadn't stopped, they would have to bring him down to the NICU. I remember trying to focus on the details, but having a hard time doing so. 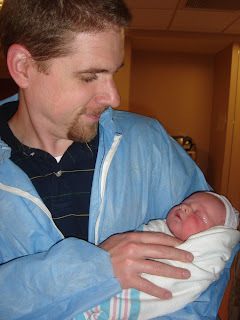 These pictures are from right after I woke up and right before Linus and Duncan went to the NICU. I also remember extreme pain. Since I hadn't had any local anesthesia, I could feel everything. The kneading, in particular, was excruciating. They brought me to the NICU on my gurney to see Linus before they brought me to my room in post partum. Duncan had tears in his eyes when I got down there, which scared me, because I thought something was wrong with Linus. He said he was just worried about me. (He had the NICU nurse call up to recovery several times apparently.) 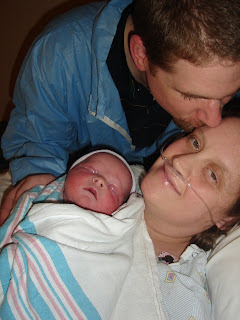 By that point, Linus had already had his first chest x-ray and had been admitted to the NICU. He was about three hours old. I got to hold him for the first time, for a few minutes. He was still grunting. I then had to leave my brand new baby and go to my room which was on the next floor up, but felt like a millions miles away. *Warning: Only read the following paragraph if you can handle medical yucky stuff. I had an IV access in one of my hands or arms for the better part of my time in the hospital. Each one can only stay in for five days, therefore, I had many sticks. I became known as a "hard stick." This means that often several attempts had to be made before an IV was successfully started, with many veins "blowing" as attempts were made. (Can we say major swelling and bruising?) For surgery and other procedures, an 18-gague needle is preferred. The night before my c-section, my nurse was given the order to put in the access that would be used for surgery. She decided to use a 20-gague needle (which is smaller), since I was known hard stick. This turned out to be a very bad decision. 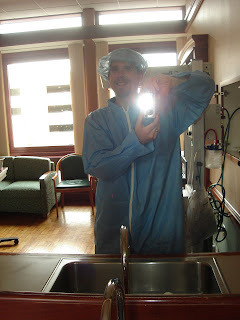 The anesthesiologist preferred to have an 18 in me while surgery occurred, especially since I was going under general. After many attempts, she thought she'd successfully started one before surgery, just in case, that wasn't used until I was in the recovery room. At that point, it was determined that it actually had not taken. I remember counting over 10 sticks in the area she had been working. This issue will come into play the day after Linus' birth as well, when I needed to have an MRI. Oh yeah, it just keeps getting better doesn't it? I CANNOT BELIEVE what HARD experience this was and has been for you. And I can't believe there is still MORE?!?! What in the world did they put in that IV that they thought was working?! Was it antibiotics for Group B strep?